Video documentary is also available on Jane’s Vimeo site. 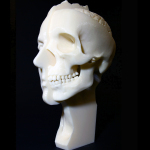 Memento mori and vanitas artworks function to remind viewers of their small scale in relation to the universe, of their mortality, prompting us to live better, more compassionate lives, as a result . 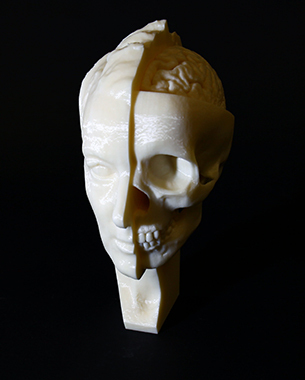 Neuro Memento Mori is inspired by an object in the Wellcome Trust Permanent Collection, “Wax model of a Female head depicting life and death” (Unknown 1701-1800). It shows a woman’s bisected head, the left half apparently a detailed portrait of a living woman, open-eyed, with painted lips and blond hair arranged in ringlets. Her left hand frames her face while the right half of her head is shown in post mortem decay. Resting on her skeletonised right hand, her skull crawls with insects, maggots and worms. A snake emerges from her empty eye socket. This compelling object prompted me to question whether, as we look at memento mori artworks, we do ‘remember, we must die’. What parts of our brain are active when we look at these artworks, and, when we contemplate death directly, without looking at memento mori art? 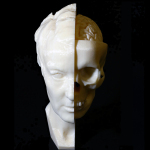 Made in collaboration with neuroscientists Zoran Josipovic (NYU) and Andreas Roepstorrf (Aarhus University), I looked at representations of memento mori while in a MRI scanner that records my brain function. Following Josipovic’s instructions, I learned to meditate, to contemplate death, and repeated that meditation in the scanner. 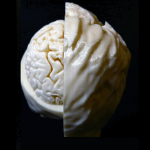 Neuroimages were processed to produce 3D data of my brain, to make 3D printed sculptural objects. 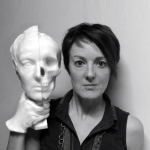 The form of the life-sized portrait sculpture refers to the Wellcome Trust object, the artist’s head is dissected, revealing the skull and brain. 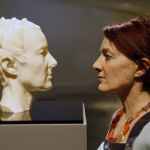 Video and computer animations are then projection-mapped onto the sculpture to create a contemporary memento mori. Following Zoran Josipovic’s instructions, she has learned to meditate, specifically to contemplate death. She will repeat the meditation exercises in an fMRI scanner. Accumulated fMRI brain images will be processed, producing 3D data of the artist’s brain. 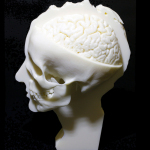 Sculptural objects made from this data will show the brain in general and highlight the active areas identified during the meditation exercises. The collaborative process also forms the basis for co-authored papers. Can contemporary neuroscience and new imaging technologies increase our understanding of consciousness? 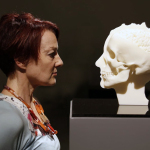 When we look at memento mori artworks are we prompted to contemplate our own mortality? What parts of the brain are active when we look at these artworks? What parts of the brain are active when we meditate on death? Is there any similarity in brain function in these two instances? 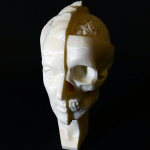 3D printed sculptural objects based on the structure and function of the brain are i production. The first two are shown here and are on display at the new Moesgaard Museum in Denmark.